I have always been fascinated by hedges maybe because it was a part of my everyday life growing up. In a little town in the Philippines where I came from, hibiscus were used as fence-plants. They are planted closely so that they would form a hedge along the roads. Then I went to Britain where I saw a completely different application of the hedge. 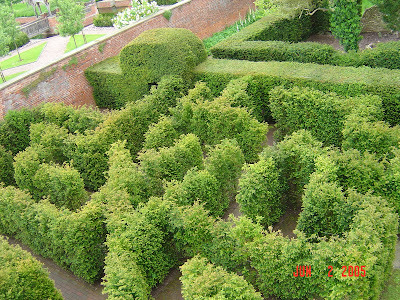 Hedges are designed geometrically to form mazes and labyrinths. Although mazes are rooted on myths of long time ago, they maintain a classic appeal to people of all ages. Today, they have become part of gardens in many countries of the world. They are designed for entertainment, recreation, as object of art, object of magic and meditation. Mazes in the gardens are like living puzzles. Unlike the labyrinths, mazes have dead end and therefore you can get lost in it...which probably provides more challenge and attraction to the adventurous ones. Here are three examples of mazes, the ones that I've seen, in Britain. Notice that the plants used are different. 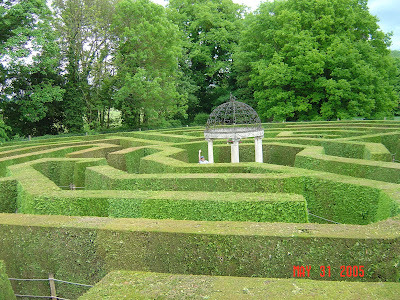 The Murray Star Maze, was designed by the world renowned Maze designer Adrian Fisher, is Perthshire's only maze. Designed in the shape of the five pointed star that's featured in the Murray family crest. The maze comprises 2000 beech trees, half copper and half green, planted in a way to create a unique tartan effect. I did not have a good position to take a picture that would show the overall effect of the design. The Jubilee Maze a.k.a. "The Amaging Hedge Puzzle" is about twenty years old. It was designed by Lindsay and Edward Heyes. Edward Heyes does the trimming himself and according to his records it takes him 10 weeks per year to trim the hedges. The maze is made of 1,039 Port Orford Cedar bushes. The maze garden at Hampton Court in Herefordshire is made of a thousand yews with a gothic tower at its centre. In this picture the plants were in the process of being trimmed. 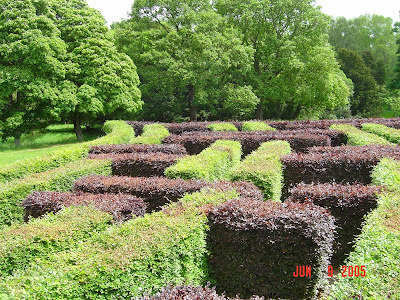 If you have a land to spare and a dream to have tourists visiting your garden, then plan on adding a maze to your garden. This will surely amaze your neighbors. Visit your local professional nurseries not only to see what's available and adapted to your area but also to see if you like the plant. After you have selected your type of plant then you can browse the internet for a more reasonable price. Hedges are live garden structures. Take time to care and train them. Hedges provide architecture and structure to any garden. The strong lines that they make provide an anchor for everything else that are added to the garden. Hedges provide a privacy feature as they can be used as fence and even divide gardens into rooms. Hedges are shrubs that have been planted closely and allowed to grow into each other's space and trained into a desired shape and size. Hedges look neat and disciplined but that does not happen without the gardeners intervention. A good hedge require constant pruning and shaping. Left alone for a long period of time, hedges will grow on their own way and eventually look wild. Gardeners need to be ruthless in pruning hedges so that they would maintain their intended shape and size. My own boxwood (Buxux microphylla) hedges keep on growing wider and taking too much space into the pathway. Just like New Year's resolutions are thought of at the beginning of the year, so gardening plans ought to be also. You want to loose weight... therefore go ahead and think of the ways that you can achieve that. So you decide to shorten your hybernation. While you are panting on the treadmill or sweating your muscles out in the gym you can also be thinking of the things that you want to see in your garden come spring and summer. Imagine yourself in your skinny form walking in the garden or by the pool. Well, that picture needs to include some color in the background such as flowers and greenery. That can be fixed, right? You might even want to look like a health goddess walking along rows of life-prolonging-herbs and draping with high-in-antioxidant fruits of various forms and fiber content. Did you say you want organic fruits? You can certainly produce your own organic you-name-it...but you've got to plant a garden. You won't loose your excess poundage either is you don't start moving or changing your habits. "The fact is that farming is not a laboratory science, but a science of practice. It would be, I think, a good deal more accurate to call it an art, for it grows not only out of factual knowledge, but out of cultural tradition; it is learned not only by precept but by example, by apprenticeship; and it requires not merely a competent knowledge of its facts and processes, but also a complex set of attitudes, a certain culturally evolved stance, in the face of the unexpected and the unknown. That is to say, it requires style in the highest and richest sense of that term." Plant a garden...it's good for you and your environment. Tropical Zone. Citrus fruits like oranges and lemons start out green and remain in that color till maturity. I remember, having grown up in the tropics, that all the citrus fruits I've seen were green. When they are mature and harvested their color are still green different only from their immature counterparts by the shine and gloss on the rind. By the time they turn orange or yellow, they are already over-ripe and cottony and tasteless. Commercially grown citrus can be treated with ethylene after harvest to induce uniform and timely yellowing for a more appealing look. Temperate Zone. Citrus plants grown in temperate places with mediterrenian-like climate, low temperatures induce a change in color to deep orange or yellow even before the fruits mature. The color can be deceptive. It is important to harvest the fruits when they are fully mature, it is when the sugar and the acidity balance is at its best. Hidden from our eyes are processes that are constantly happening in the plants. Shifts in these processes are caused by a number of environmental factors. The green color in unripe citrus plants is a result of the dominant presence of chlorophyll on the rinds. The yellow or orange color in ripe citrus fruits is a manifestation of the high concentration of carotenoids. When temperatures go down to a certain critical level, such as in the winter, the rate of chlorophyll production in the plant slows down or completely stops. Furthermore, the existing chlorophyll undergoes a process of degradation while the biosynthesis of carotenoids increases, particularly in the fruits. Stroll in your garden... its good for you and your plants.